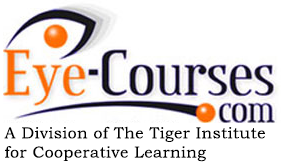 © 2018 Eye-Course.com a Division of The Tiger Institute for Cooperative Learning. All Rights Reserved. REFUND POLICY: A refund shall be made under the following circumstances:1) A course has technical issues and will not work; 2) A course is purchased by mistake and not taken; 3) No refund will be made after the course is taken unless it can be shown the continuing education credit is not accepted or expired; 4) There will be a minimum of five business days to process refunds.